Successfully Added Multi-Format Memory Card Reader (SD / MS / TF / More!) to your Shopping Cart. Multi-Format Memory Card Reader (SD / MS / TF / More!). This multi-card reader for SD cards, Sony memory sticks (MS), TF cards (microSD cards), and other memory cards lets you access, copy, and backup a wide variety of flash memory cards. Want to access your memory cards without wasting time searching through dozens of different devices and wires? This one small Tech Gadget is all you need. Just plug this multi-card reader into your computer and you can quickly and easily access a wide variety of SD cards, memory sticks (MS), micro SD cards, and other popular memory cards. With a fashionable design, you can place this right on your desktop so its there whenever you need it, and it is also small enough to take anywhere you go for mobility and convenience. 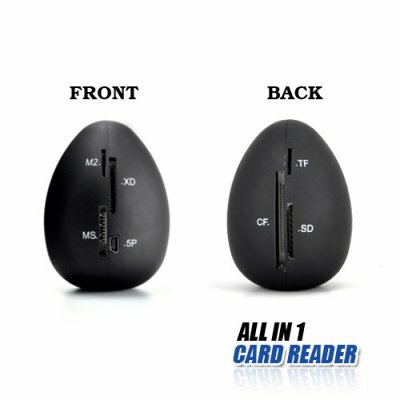 With this all-in-one multi-card reader, editing, saving, copying and making data backups is easier than ever before. If you have a cell phone, digital camera, camcorder, keychain USB flash drive, then you know how frustrating it is needing multiple devices and cables to read and transfer files to your computer. Well, with this Multi-Format Memory Card Reader you can transfer the files from all your devices quickly and easily. Makes a great addition to any home or office computer desktop. Resellers, take advantage of this wholesale offer to stock up on this item for your store or online shop. With great functionality and ease of use, this item is sure to be a hot seller. Click "add to cart" to get yours today. Can I use this device with phones TF card? Yes, this card reader works with Micro SD and Trans-Flash (TF) cards.